This article is about the igneous rock. For other uses, see Porphyry. Porphyry deposits are formed when a column of rising magma is cooled in two stages. In the first stage, the magma is cooled slowly deep in the crust, creating the large crystal grains with a diameter of 2 mm or more. In the second and final stage, the magma is cooled rapidly at relatively shallow depth or as it erupts from a volcano, creating small grains that are usually invisible to the unaided eye. This process, which occurs primarily when fluids are driven off the cooling magma, is one of the main reasons for the existence in the world of rich, localized metal ore deposits such as those of gold, copper, molybdenum, lead, tin, zinc, rhenium and tungsten. This enrichment occurs in the porphyry itself, or in other related igneous rocks or surrounding country rocks, especially carbonate rock (in a process similar to skarns). Collectively, these type of deposits are known as "porphyry copper deposits". Rhomb porphyry is a volcanic rock with gray-white large porphyritic rhomb- shaped phenocrysts embedded in a very fine-grained red-brown matrix. The composition of rhomb porphyry places it in the trachyte–latite classification of the QAPF diagram. Rhomb porphyry lavas are only known from three rift areas: the East African Rift (including Mount Kilimanjaro), Mount Erebus near the Ross Sea in Antarctica, and the Oslo graben in Norway. It is intrusive. 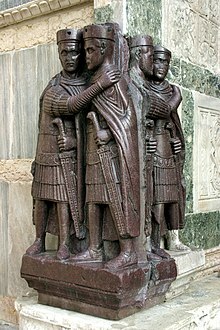 Pliny's Natural History affirmed that the "Imperial Porphyry" had been discovered at an isolated site in Egypt in AD 18, by a Roman legionary named Caius Cominius Leugas. Ancient Egyptians used other decorative porphyritic stones of a very close composition and appearance, but apparently remained unaware of the presence of the Roman grade although it was located in their own country. This particular Imperial grade of porphyry came from a single quarry in the Eastern Desert of Egypt, from 600 million-year-old andesite of the Arabian-Nubian Shield. The road from the quarry westward to Qena (Roman Maximianopolis) on the Nile, which Ptolemy put on his second-century map, was first described by Strabo, and it is to this day known as the Via Porphyrites, the Porphyry Road, its track marked by the hydreumata, or watering wells that made it viable in this utterly dry landscape. Porphyry was extensively used in Byzantine imperial monuments, for example in Hagia Sophia and in the "Porphyra", the official delivery room for use of pregnant Empresses in the Great Palace of Constantinople. After the fourth century the quarry was lost to sight for many centuries. The scientific members of the French Expedition under Napoleon sought it in vain, and it was only when the Eastern Desert was reopened for study under Muhammad Ali that the site was rediscovered by James Burton and John Gardiner Wilkinson in 1823. As early as 1850 BC on Crete in Minoan Knossos there were large column bases made of porphyry. All the porphyry columns in Rome, the red porphyry togas on busts of emperors, the porphyry panels in the revetment of the Pantheon, as well as the altars and vases and fountain basins reused in the Renaissance and dispersed as far as Kiev, all came from the one quarry at Mons Porpyritis ("Porphyry Mountain", the Arabic Jabal Abu Dukhan), which seems to have been worked intermittently between 29 and 335 AD. Porphyry was also used for the blocks of the Column of Constantine in Istanbul. In countries where many cars have studded winter tires such as Sweden, Finland and Norway, it is common that highways are paved with asphalt made of porphyry aggregate to make the wearing course withstand the extreme wear from the spiked tires. ^ Dietrich, R. and Skinner, B., 1979, Rocks and Rock Minerals, pg. 125. ^ a b "Via Porphyrites". Saudi Aramco World. Retrieved 2012-10-14. ^ Emerson Howland Swift. Hagia Sophia. Retrieved 2012-10-14. ^ A. G. Paspatēs (2004-04-30). The Great Palace Of Constantinople. Retrieved 2012-10-14. ^ C. Michael Hogan (2007). "Knossos fieldnotes". The Modern Antiquarian. Retrieved 2012-10-14. ^ "Archaeology". Arch.soton.ac.uk. 2012-09-25. Archived from the original on 2008-03-21. Retrieved 2012-10-14. ^ "Al-Ahram Weekly | Special: East of Edfu". Weekly.ahram.org.eg. 1999-02-24. Archived from the original on August 13, 2012. Retrieved 2012-10-14. Wikimedia Commons has media related to Porphyry.